Heading to NYC this month? 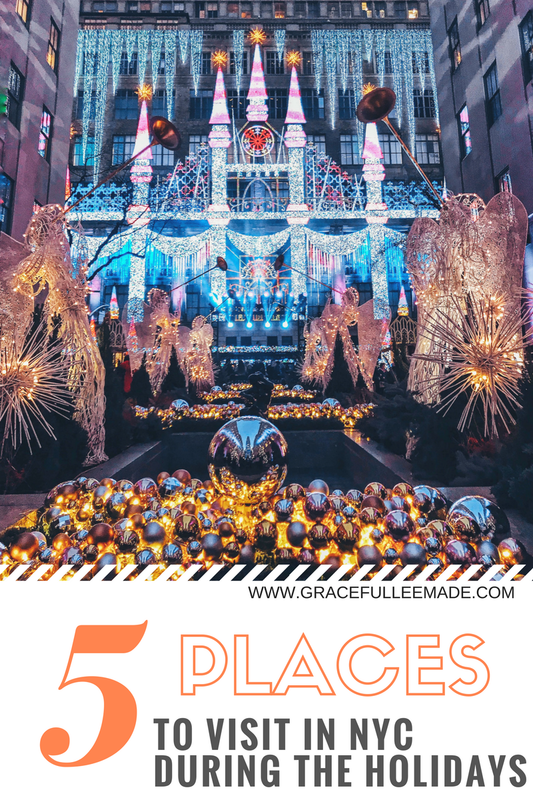 Today's post is all about where to visit during the holiday season. A lot of you have requested for a NYC guide on what to do / see during the holidays. 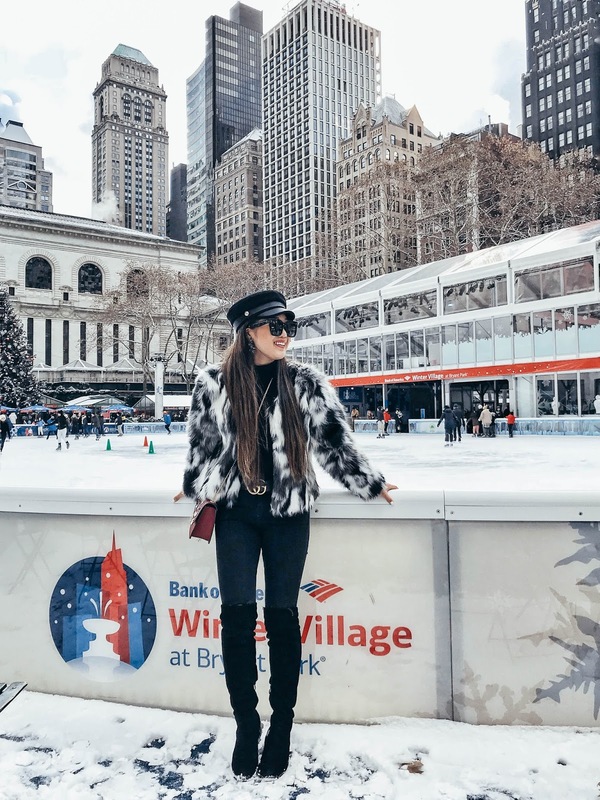 For someone who likes to research and find new things to do in the City, I thought it was a great idea to round up some of my favorite places I've visited this season, and share my experiences with you all. I'm also working on a New York City NYE guide, so be sure to stay tuned for that! I find myself on Fifth Avenue more times than I can care to remember. It's one of my favorite memories that I have here in NYC. 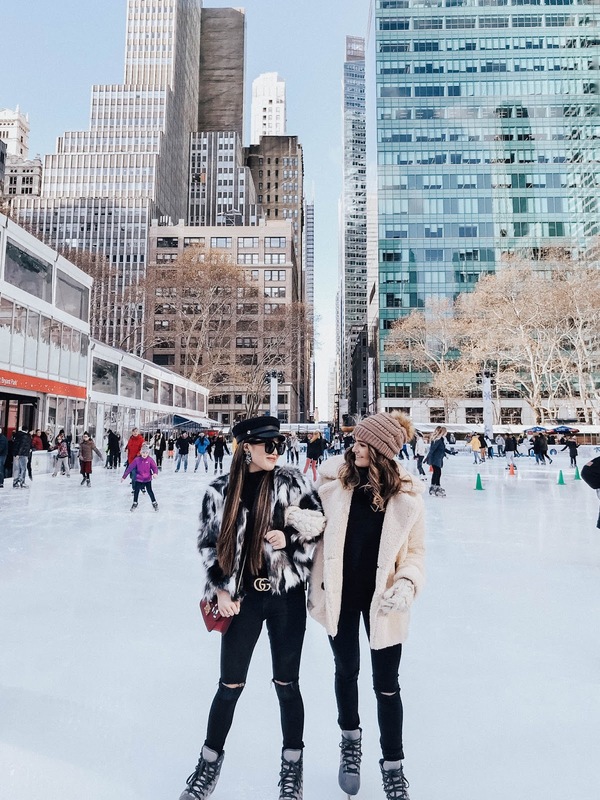 Whether it's shopping, eating, or just walking up and down Fifth Avenue, the street is always packed with tourists or New Yorkers trying to get somewhere. However, the window display is a must-see and absolutely beautiful in person. I would recommend going at night in order to see the lights. This has to be one of my favorite rooftop bar experiences yet. 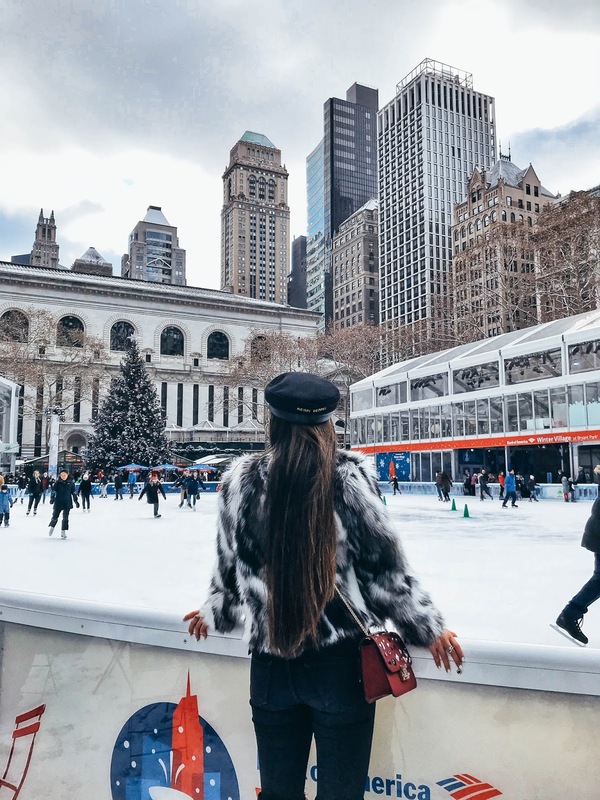 Not only can you experience the NYC skyline from a heated igloo while sipping on spiked apple cider, hot chocolate, or their amazing raspberry mojitos, but you also get to do all of that while wearing fluffy red robes. All in all, this is a great place to socialize and take in the breathtaking view. One of the iconic places in Gossip Girl season 1, I've always wanted to visit the Palace Hotel during Christmas. There's a huge beautiful Christmas tree located on the opposite entrance of the hotel. Talk about a perfect photo opp. 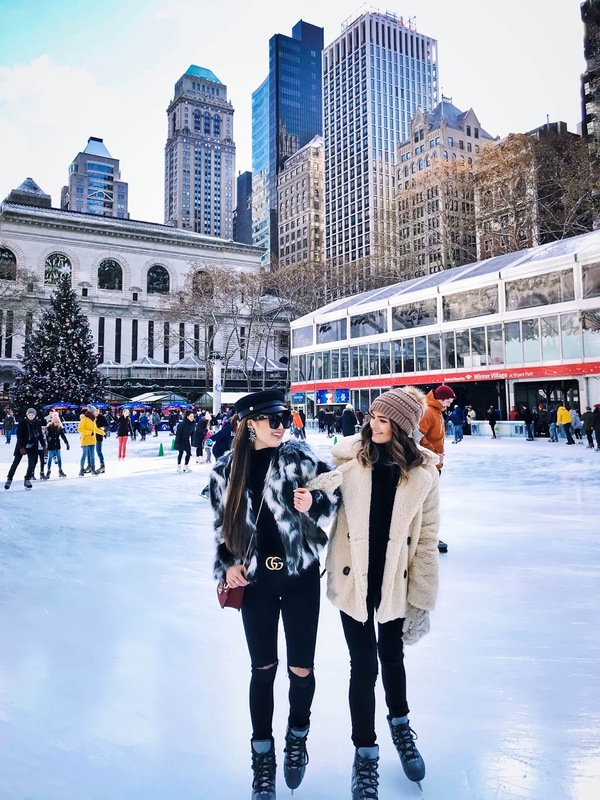 Yesterday was my first time ice skating here in NYC. A lot of you may have seen my Instagram Stories and Snapchat of me explaining that I figured skated competitively for seven years. It was always a big part of my life growing up, and it felt so good to be on the ice again. 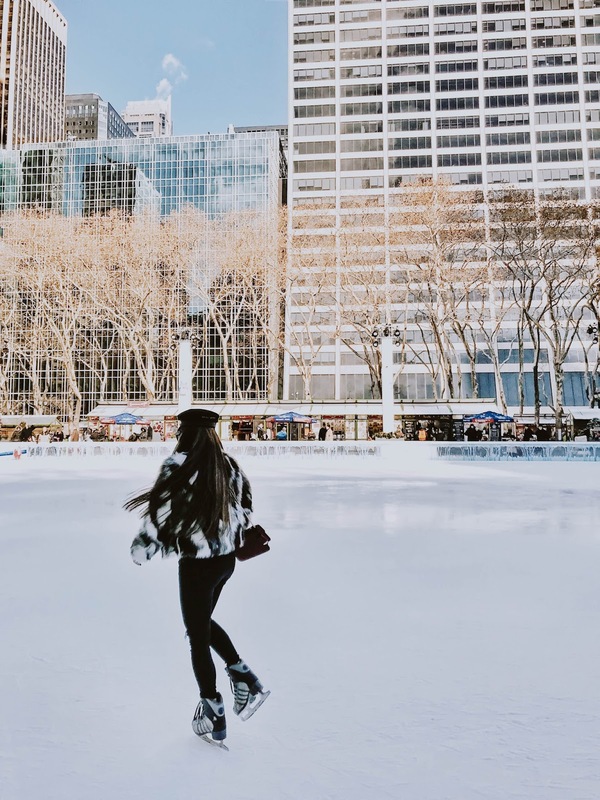 I really enjoyed the Bryant Park skating rink because it's located in the middle of the city scene, and you really get a beautiful all-around view. Not to mention... after skating, sip on hot chocolate, eat some food, and walk around the shops located in the Park. 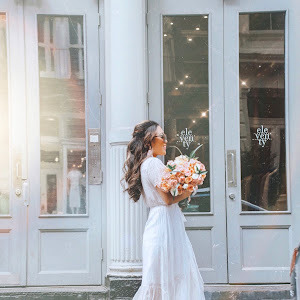 Head over to the Upper East Side and check out the Plaza Hotel. I love all the festive decorations on their windows and even the entrance is decked out with Christmas lights. Inside, you can sip on afternoon tea in the Palm Court, enjoy the Champagne Bar that overlooks the famous Pulitzer Fountain.